I was to install firefox on my system, a new build, so i went on my D: drive and opened the folder of firefox, and Norton flaged the installer of firefox as 'downloader' , how is that possible..?? 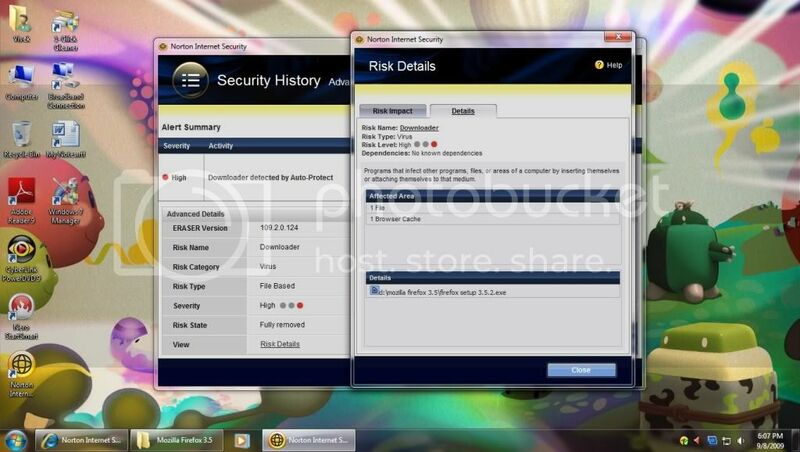 Re: Norton detected firefox installer as downloader! I ran full system scan, and here is the log of my system, there is no other threat..
Do you remember where you downloaded the Firefox setup.exe from? Perhaps try another download and check it out. Did you download the Firefox setup file from legitimate Web site or Authorized Mozilla Web site? If those files are identified as proper false positives by Security Response, necessary update patches will be released to avoid misidentification of those legitimate files. In mean time, disable Auto-Protect, add the respective exceutable file(.exe) to the file exclusion list and then re-enable the AutoProtect back. I tried to download from mozilla.com the official site for firefox, and again i got downloader detected..!! see yourself, i tried to download it again by my IE 8.. Here is my another try..i think someone should check and tell me, are you all getting the same thing.. The same thing happened to me today. I downloaded Firefox 3.5.2 yesterday from the official website via one of the mirrors (only remember it being a ".com" address). Installed Firefox yesterday. Updated Norton NIS 2009 and performed full system scan with nothing detected. This morning when I simply clicked on the download folder in which I had placed the Firefox installer file, Norton flagged a "downloader" threat and removed the Firefox installation file and browser cache. Confirmed here - NAV detected firefox intaller as 'downloader' on two different computers. File downloaded from official mozilla download site. This is truly a false positive, which should be resolved with current definitions. There was a compromised and corrupted version of this installer going around, and the detection was too broad. If you download the firefox installer from firefox.com and its official mirrors, you should be fine. If you downloaded it from a less official source, best to throw it away and download it from firefox.com. Weird that the Dutch official download does not cause any troubles. A few more thoughts on this. I scanned the downloaded Firefox installation file immediately after I downloaded it. Norton reported nothing. I executed the Firefox file. Norton reported nothing. The Firefox file sat on my computer as Norton NIS 2009 executed a full system scan. Again Norton reported nothing. Finally, when I clicked on the folder containing the Firefox file, Norton Auto-Protect flagged a "downloader" threat. If anyone from Norton can explain this seemingly inconsistent NIS 2009 behavior, I would appreciate it. Thanks. hi, i think that mozilla website is been hacked,because i have download it with NIS 2008.it detected as downoloader.and the firefox file set up file is downloadded as suspicies name. How much time was there between the events you mention? It is possible that a new virus definitions update or pulse update that contained the false positive detection was installed just before you clicked on the Firefox installer folder. No, the site was not hacked. Most files on mozilla.com are mirrored elswher and double or triple checked for viruses. For instance in Switzerland the university network switch is the official mirror and that file gets flagged too. More proof to the point is that I had made the upgrade from Firefox 3.0 directly to 3.5.2 and the setup file had been sitting in my archive folder since then, triggering no NIS warning until yesterday (Sep 8, 09). No other scanner I have access to reports the FF3.5.2 setup file as infected, Not McAfee Virus Scan Enterprise, not Kaspersky, not Avira, not f-Secure. It is very well possible that a new pulse update with the bad signature was downloaded juit before your last action. As I said the file had triggered no warning for weeks until yesterday and i have verified that it was untouched via its file hash. Not that's not really weird I have found that only the US-English installer seems to trigger the warning, not german, french, italian. Reason for this being that the different language packs obviously change the package enough to not trigger the false postivie. Oh and by the way. I tried to report the false positive yesterday, through support chat. BIG, BIG MISTAKE! The incompetent fool in the outsourced support center in probably India did not seem to comprehend the concept of "FALSE POSITIVE". Neither did he comprehend the fact that only the FF 3.5.2 setup file was affected and not the installed copy of the browser. So in a remote session he COMPLETELY WRECKED MY FF3.5.2 installation, by installing Firefox 1.0.6 (yes one.zero.six!!!!) over it. He then kept going "But I have resolved your issue, no?" and I kept repeating "No you haven't even understood the issue, but you have completely screwed up my FF installation!" Needless to say that he ignored my requests for an address to complain about him to or to turn me over to his supervisor. Worst support experience I have had in ages. NEVER, I mean NEVER let an outsourced Symantec support humanoid connect to your PC if you still need it for anything. They just happily click around, oblivious to the consequences and don't even tell the user what they are about to do. I eventually disconnected the support session before he could do more damage to my system. Firefox site is not hacked, it's a glitch in virus definitions.....i think symantec people are not sleeping on this issue..!!!!!!! I will state again that there was a false positive detection on the firefox installer. 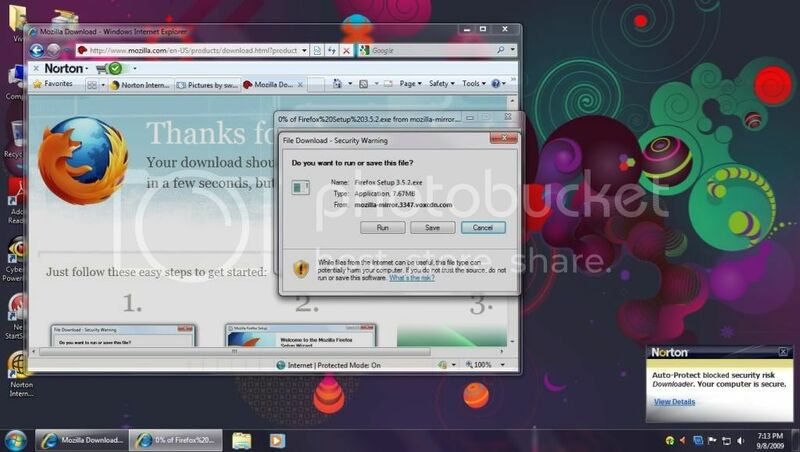 If you got this from a firefox installer you downloaded from an unofficial site, it may have been a true detection and it is safest to just download it again from firefox.com. Kiltbear, I'm sorry to hear of your bad support experience. I will relay your feedback to the VP of support. It is now rectified, i mean firefox detection as downloader, and regarding the worst support, it had happened last to last year, now things might have changed,.no need to worry bwoirhaye ..May now Symantec's support would be best out there..So never mind about the support problem i had and this firefox problem is fixed so need to worry, everything is cool and calm now..!! Symantec has quickly taken action on my every problem, and nowi have no complaints. And as i feel the best support for anything is this community forum..